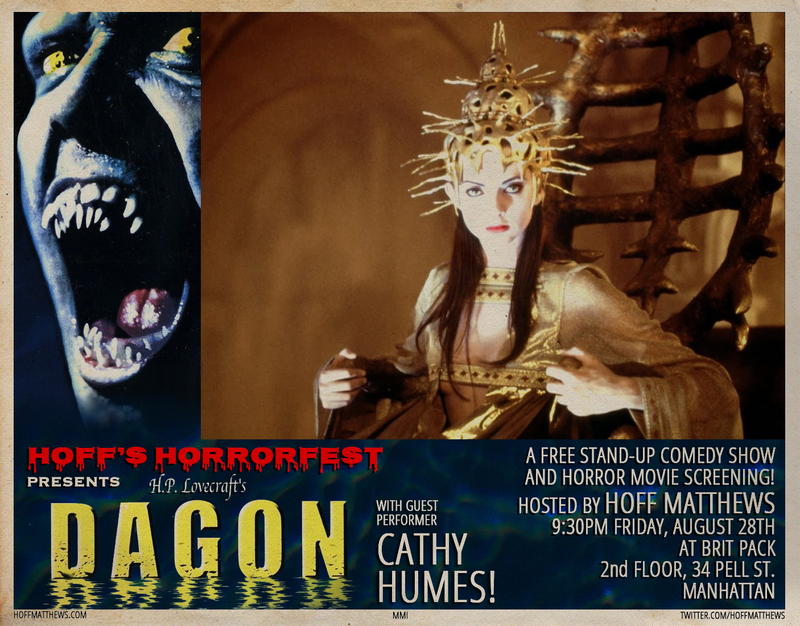 Hoff’s Horrorfest Presents: DAGON featuring Cathy Humes! Hoff’s Horrorfest is a monthly show at Brit Pack (NEW LOCATION: 2nd floor, 34 Pell St., Manhattan) featuring stand-up comedy from Hoff Matthews and a guest performer, followed by a horror movie screening. It’s free and BYOB. This month’s installment will be at 9:30pm, Friday, August 28th. 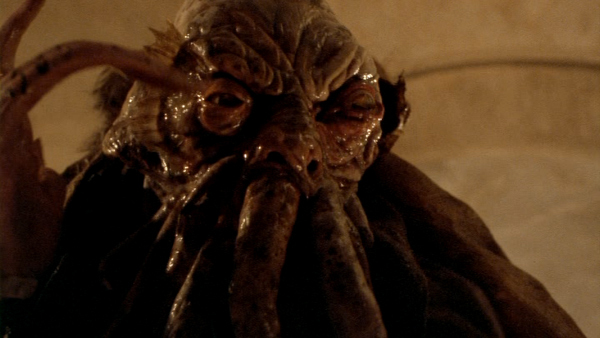 H. P. Lovecraft adaptations are like pizza to me: Even when they’re bad, they’re good. I wouldn’t argue that The Unnamable is a great cinematic achievement, but I still enjoy its cheesy parade of tropes. However, I’m also from Connecticut, home of the best pizza in America, so I appreciate that when something that’s good when it’s bad is good, it’s great. And Dagon is some real good pizza. Maybe not Sally’s good, but probably on the level of Modern. We should expect no less, given that Dagon was brought to us by Stuart Gordon, director of Re-Animator, the most popular Lovecraft screen adaptation to date. And while this story of a Spanish fishing village with a dark otherworldly secret (based more on “The Shadow Over Innsmouth” than the actual story “Dagon”) may not have anything quite as revoltingly memorable as Re-Animator‘s “head” scene, it’s still an almost flawlessly engaging thrill ride of spookiness. And it’s not NOT revoltingly memorable in its own right! I’ve been meaning to show this movie ever since I started Horrorfest and I’m excited to finally do so. My guest performer this month is Cathy Humes, whom I booked because she’s a funny up-and-coming comedian who referenced Re-Animator in a recent Facebook comment, not because she and I have the same hair, even though we kind of do. Also this is our first show at Brit Pack’s NEW LOCATION on 34 Pell St., just a few blocks south of the old place, so that’s exciting too! See you on the 28th! ← Upcoming Show: August’s HP5000!